Goalkeeper Marty Gallagher, not for the first time in his Institute career, played a major role in a hard earned victory. The 27-year-old made a top draw save to keep out Warrenpoint Town’s Robert Norton’s second half free-kick. With ’Stute leading thanks to Michael McCrudden’s first half penalty, Saturday’s game was still in balance as the visitors had began the second half on the front foot. Norton saw his long range free-kick take a wicked deflection off the wall but Gallagher reacted quickly to re-adjust and keep the effort out. “It’s one of those ones, he’s hit a free-kick and it took a deflection off the wall. I was going one way but managed to get back and get down to the ball,” stated Gallagher. Gallagher knows that both himself and his team-mates need to use the Brandywell in their favour and try to make their temporary home a fortress. We know that this season we need to stay solid at the back. We need to shut-up shop and make sure we keep making it hard for teams to break us down. “First and foremost, it’s good to get the three points,” he added. “We know when teams come here we can’t make it easy for them. This is where we need to make our home advantage count but yeah it’s always nice to keep a clean-sheet. “I thought the two boys in front of me - Dean (Curry) and Skinny (Caoimhin Bonner) - were outstanding and Colm (McLaughlin) and ‘Japper’ (Ryan Morrow) also defended really well, so we looked solid. The net-minder, who along with Ryan Morrow, Eamonn Seydak, McCrudden, Niall Grace and Mark Scoltock, was in the Bluefin Championship Team of the Year last season, knows how important clean-sheets will be for Paddy McLaughlin’s side. 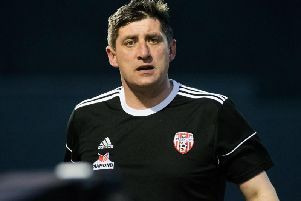 In their opening two games at the Brandywell against Newry City and Warrenpoint Town, ’Stute haven’t conceded a goal and Gallagher hopes that run continues. “We know that this season we need to stay solid at the back. We need to shut-up shop and make sure we keep making it hard for teams to break us down,” he confirmed. “What we have going forward, we’ll hurt any team. With the three boys going forward, the pace we have in our side and the Brandywell being such a big pitch, it suits us and we know we can use it to our advantage. McCrudden has netted three goals in as many games and Gallagher knows how important the club’s leading marks man is to the team. “Michael’s first goal was a penalty and he scored a few of them last year. His second goal, which I was saying to him in the changing room, that I was right behind it and he got some whip on it,” he added.